Do you have a creative mind? If yes MGOCSM is organising a Logo Design Competition for you. 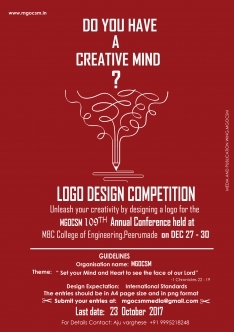 MGOCSM is providing an opportunity to expose your creative ability by designing a logo for the 109th Annual Conference held at MBC Engineering College Peerumedu from 27th to 30th of December 2017. Design a logo based on the theme "set your mind and heart to see the face of our lord" 1 chronicles 22:19 and send your entries to mgocsmmedia@gmail.com on or before 23rd October 2017. Unleash your creativity by participating in this competition.